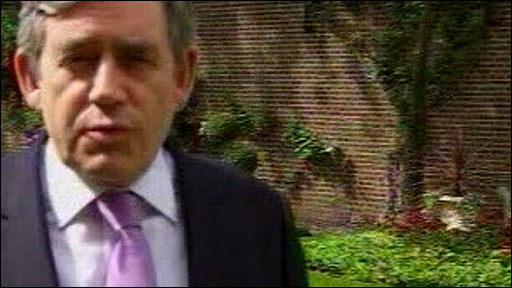 Prime Minister Gordon Brown has gone back to YouTube for a Labour election broadcast, two weeks after his much criticised expenses reform webcast. He said voters' choice on 4 June was between his plan to "grow our way out of recession" and public service cuts. 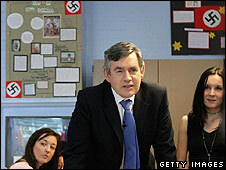 Mr Brown has been seeking to regain the initiative with a new schools policy. 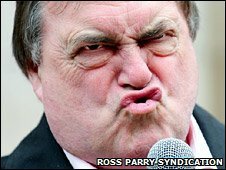 But those efforts were hit when John Prescott, apparently referring to the expenses broadcast, joked the PM had the "worst bloody smile in the world". Speaking on the campaign trail in York Mr Prescott - who was deputy PM for ten years under Tony Blair - told reporters: "I have worked with Gordon Brown for an awfully long time. "He must have the worst bloody smile in the world, but the man has got the ability and the intellect to get on with the job." Asked later about his comments, Mr Prescott said: "Only the British media would make such a big fuss about a bit of street theatre on the campaign trail. "Gordon, and indeed myself, do not have the best smiles in the world but, as I also said in York, he is the best man for the job, making the big decisions to lead us out of this recession." There was much speculation about Mr Brown's leadership over the bank holiday weekend after a week in which the government suffered a shock defeat in the Commons over the issue of Gurkhas' rights of settlement. And Mr Brown had to drop a key proposal for reforming MPs's expenses - announced to some surprise on the Downing Street website and YouTube only two weeks before, in the face of widespread opposition. Some Labour MPs were unhappy at the way the proposal was announced - while others criticised the PM's appearance during the broadcast. One, Gordon Prentice, said it had been "too horrible to watch". Communities Secretary Hazel Blears wrote in an article: "Promote your message via YouTube if you want to. But it is no substitute for knocking on doors" - she later denied it was an attack on Mr Brown. But Mr Brown had insisted he would continue to use the internet as an important information tool. The party political broadcast, due to go out on TV channels later, appeared on YouTube and the Labour Party website. In it Mr Brown is shown at the G20 summit, in New York, addressing Congress in Washington and features shots of wind turbines, apprentices and homes - accompanied by a voiceover from the prime minister. He is also shown shaking hands with US president Barack Obama with whom he says he "shares the same values" including a desire to build a stronger society. Analysis: What is Blears up to? He adds: "You can't cut your way out of recession - you have got to grow your way out of it." Earlier in a round of interviews with the BBC and other broadcasters before the weekly cabinet meeting, Home Secretary Jacqui Smith said the prime minister was focusing on the issues she said were important to Britain - the swine flu outbreak and the economy. She said she expected Mr Brown to be prime minister when the general election was called - due by next June - adding: "I hope he will be. I think it's the right thing for this country if he is. And I expect him and I want him to be prime minister after that election." Mr Brown was the "sort of politician that we need leading our country" at a time of economic crisis - "helping people through difficult times and building for the future as well". The prime minister was at a school in south London earlier to announce plans to allow parents to trigger council intervention in unsatisfactory schools in England. Meanwhile the prime minister's spokesman has said he retains full confidence in Hazel Blears, who, he said, was "horrified" at suggestions that her article had been an attack on Mr Brown. The No 10 spokesman added: "The prime minister is satisfied that the cabinet is supporting the agenda he is setting out, that they are working together, that the cabinet is coming together to deal with the big issues facing the country." But at the launch of the Conservatives' local election campaign on North Tyneside, Mr Cameron said the government now had a "time horizon". He said: "They will be trying to get through the next few days, the next weeks, trying not to fall apart and that is not good for the country." He added: "People feel frustrated, people have to put up with a divided, weak, disorientated government." Ms Blears' article in the Observer raised eyebrows over her YouTube reference and also a comment that all ministers had "a collective responsibility for the government's lamentable failure to get our message across". However she went on to issue a statement saying that any suggestion she was criticising Mr Brown's leadership was "completely wrong". Mr Brown's deputy Harriet Harman, who has repeatedly found herself at the centre of leadership speculation, told the BBC: "I don't want to be prime minister and I don't want to be leader of the party." There were also stories that Labour backbenchers wanted Alan Johnson to replace Mr Brown. But the health secretary told the BBC he had no "aspiration" to be party leader and said he believed Mr Brown was "a man for these times" who was doing a better job "than I could do it or anyone else".